Start Your Own MLM Company. 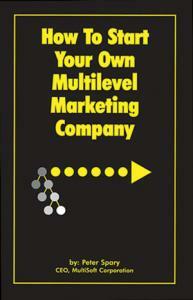 Our How to Start Your Own Multilevel Marketing Company book . . . was designed to help you launch your own successful enterprise. This professionally produced, 300+ page work is laden with information that you can utilize. . . . The Multilevel Startup Guide is a fantastic way to introduce yourself to what it will take to launch your own network marketing company.